Having completely shirked my travel blogger duties in 2018, I’m taking the first step towards redemption with this blog post. Huzzah! Those following me on Instagram may remember enthusiastic Story recaps of travels to Hawaii, Alaska and several California destinations in 2018, but I sadly never got around to compiling blog posts on a lot of them- hashtag postdoc life. 🙆🏽 I’m hoping to make amends in the new year and finally get to it, even if only to do justice to my dear husband’s photographer efforts and help those of you planning to visit these places in the future. 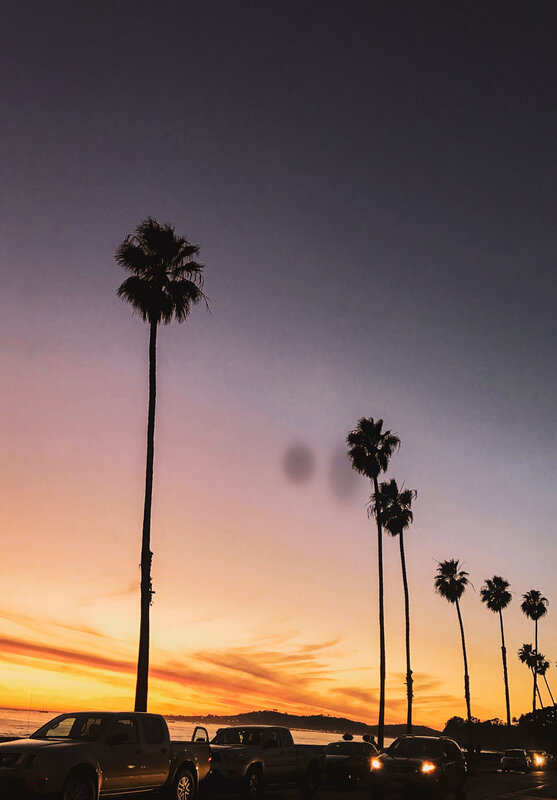 I know from our most recent conversations on Instagram that several of you were/are headed to sunny Santa Barbara, so here is a mini-guide to SB, adapted fresh off of our New Year’s road-trip from the Bay Area. As for time, we spent two full days in SB and found that it was plenty to take in all the sights. *Buuuut disclaimer: We’ve explored these parts before when I lived in LA. If going for the first time, I’d recommend an extra couple of days if you can spare ‘em to explore the surroundings- the one-of-a-kind Danish village Solvang, the peaceful valley retreat Ojai, the many hiking trails in the Los Padres National Forest, etc. Stay options can be expensive in SB, especially if looking last minute like we were. Montecito Inn was our only available option at the time, but inadvertently, it worked out SO well! Nowadays, the hotel reflects its history with rustic decor, still housing the original elevator that took me back in time every time I stepped in it. There’s a lovely hot tub and pool situation that I took full advantage of + the hotel rents out bikes for free, which was perfect for grabbing breakfast in the village and checking out Butterfly Beach, right around the corner from the hotel. The location checked all the boxes for us- by the beach, close to several good restaurants including their own (takeout + robe life is THE life), and only a few minutes from downtown Santa Barbara. A short cross-road away from State Street is the County Courthouse- a must-see on all counts! The exterior façade is beautiful in Santa Barbara’s characteristic Spanish-colonial style, but the interiors absolutely blew me away. Detailed tilework adorns the white walls, the sunken gardens are a peaceful respite and the still functioning courtroom’s ceiling (pictured below) is a sight to see. Make sure to go up to the observation deck at the top of the clock tower for stunning panoramic views of the city nestled amidst the Santa Ynez mountains. We skipped going to the Mission this time as we’d seen it on a previous visit, but I’d definitely recommend seeing the beautiful grounds and learning about its 200-year history. It isn’t called as the ‘Queen of the Missions’ for no reason! I pranced around it like all the <12 year olds were doing, but so will you if there’s a gigantic rainbow in your face to see and touch and hold and hug! There’s no dearth of beautiful beaches in SB, but we ended up at Butterfly Beach purely out of convenience as our hotel was located right by it. It was only after the fact that we realized it’s most locals’ favorite beach (!) owing to its secluded nature. Since this was the only SB beach we spent time at, I can’t compare with other popular ones like Arroyo Burro and Leadbetter Beach, but I can tell you that Butterfly Beach is beautiful. It’s a long stretch of sand with fewer people than most, so we were able to camp out on our blanket all evening undisturbed. The sunset was classic SoCal gorgeousness in its fiery reds, oranges and pinks, and the absolute icing on the sunset sorbet was a pod of dolphins right by the beach! Four Seasons’ The Biltmore is located right on this beach, and cheers-ing to the new year at a table with a view was the perfect end to the night. I wish we had more time to lose ourselves in this beautiful area just a few minutes from SB, but we had to settle for a short drive through it on our last morning there. The forest has lots of hiking trails, a hidden castle (really! ), viewpoints galore and for those interested like us, offers much to learn about the historic relevance of these lands, as they’re home to California’s early inhabitants- the Chumash Indians. Brazil Arts Café- Stopped for the outdoor tables bathed in sunshine and stayed for the acai bowls.😋 Plus, it was right on State Street and the people watching was on point! La Super Rica Taqueria- Sadly, we didn’t actually eat here as it was packed and we were in a rush, but it’s supposedly the best Mexican around. Even Julia Child has said so!